I normally take vacations twice a year. The first time is during the Christmas holiday (see Learning to Unplug). The second time is at the beginning of summer. Our Christmas holiday is definitely the more restful of the two. Summer vacation usually means getting out into the garden every day to weed and then there are animal needs to address. We’ll process a certain amount of food during this time as well. This is the time of year when we’re starting to see the benefits of having our garden. However, there is normally so much work to do that I really do need the time off in order to help Rebecca manage it all. So, the vacation part comes from not going into the office each day to write. It’s not as if we won’t take some time off. There will be a few days where we go fishing first and do chores later. After all, even we have to have a bit of fun . Summer is the time for picnics, so we’ll probably go for a picnic or two to one of our favorite spots. Every summer vacation we also have some activities we do, such as putting together the annual summer jigsaw puzzle. It’s a fun way to spend a bit of time when we decide it has gotten too hot outside and want to spend a little time in the coolness of the house. Of course, kicking back in my hammock under the big maple tree next to the garden Rebecca has created for me is quite nice too. The one big thing we do every summer vacation is barbecue every day. Normally I make the meat dish every day and Rebecca makes up a vegetable to go with it. Sometimes I cook both the meat and the vegetable dish to give Rebecca a day off cooking. The smell of roasted meat is a mighty nice way to spend an evening meal. I’ll use a combination of herb seasonings from Rebecca’s garden, butter or olive oil, and selected woods to give the meat a special taste. This summer vacation will hold something special for me. I have an abundance of construction wood this time, so I’ll probably take a bit of my time out of the office to put up new shelving in our larder. Rebecca currently lacks a good place to put empty jars without cluttering up the shelves containing food. In addition, there have been times where we had such an abundance that we had to scour locations to put it all. The new shelves will ease some congestion. We’ll be back to work on July 17th. If you have any questions regarding my books, please be patient and I’ll answer them when I get back. In the meantime, don’t worry if your email message goes unanswered. I assure you that I’m not going to ignore you. Happy computing! Most people view a self-sufficient lifestyle as an experiment in boredom. It’s possible to think that the only entertainment one gets is watching the grass grow. That’s really about as far from the truth as you can get. We’ve had all sorts of excitement over the years. This past Sunday was no different. We were just about ready to head out the door for church when the post office called. Let’s just say that I thought it was a prank at first. I’ve never heard of the post office calling anyone on a Sunday. Our laying hens and second batch of meat chickens were supposed to arrive Monday morning in Reedsburg—the small city about ten miles from us. The post office was calling to let us know that the chicks had actually arrived in Portage (52 miles away) on Sunday and that we needed to pick them up before noon. So, it was off with the Sunday attire and on with the regular clothes. We piled into the car, found a place to stuff some breakfast down our throats, and then drove to Portage as fast as country roads would allow (and believe me, there is no 65 on a country road—it’s 55 on a good day). On the way home we stopped at a Kwik Trip to buy some Gatorade for the chicks. Then we rushed home, set the brooder box up for chicks, and started showing the chicks how to drink the first time. There is a misconception that all chicks are bits of yellow fluff. 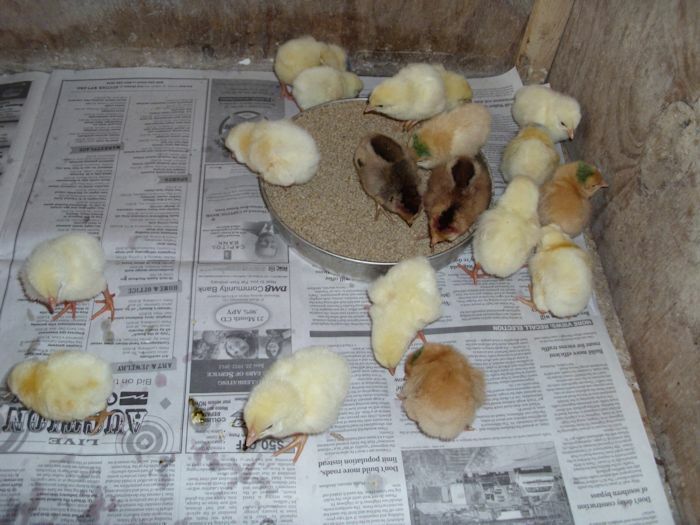 Chicks actually come in a range of colors. The meat chickens are certainly yellow, as are our Delaware laying hens, but the Ameraucana and Buff Orpington chicks look much different. The Ameraucana chicks are actually quite pretty with all of the shades of brown they possess. These chicks have a beautiful dark streak down their backs. The Buff Orpington chicks are almost an orange color. Think of it as a lovely brownish orange, rather than a pumpkin color. Each of these layers will provide different sized eggs and have different characteristics. For example, the Delaware chickens will lay a moderate number of jumbo brown eggs quite well all winter long. The Buff Orpingtons will produce a larger number of large brown eggs, but produce a bit better during the summer months. Ameraucana hens produce copious quantities of the most beautiful medium eggs you’ve ever seen. The colors range from buff, to blue, to blue-green. All three types of chicken are bred for cooler climates and won’t require any weird drugs to keep them alive. More importantly, because they’ll all be free range chickens, we’ll get superior eggs from them. Farm life does come with a wealth of surprises. This Sunday was just a reminder to be ready for anything. Let me know about your latest life surprise at John@JohnMuellerBooks.com. A lot of you know that I write articles for Software Quality Connection (SQC) from time-to-time. In fact, you can find the newer articles listed in the Articles category of this blog. All of the existing articles and any new articles I write will still be available for your viewing pleasure. However, they’ll be moving to a new location, SmartBear blog. You can read about this update in the Software Quality Connection – Now Part of the SmartBear blog post. Make sure you subscribe to either the RSS feed or e-mail messages so that you get all of the amazing posts from this organization. Of course, I’m concerned that you’re able to continue to read my articles. If you experience any problems, whatsoever, accessing one of my articles, please let me know. I’ll do my best to clear things up. For example, my most recent SQC article, “How to Inherit Somebody Else’s Code” now appears at http://blog.smartbear.com/software-quality/bid/167035/. My future articles will appear on the new site. I’ll let you know as they get published so you can take a look and provide your usual feedback to me. Let me know if you have any questions about the new setup at John@JohnMuellerBooks.com. Last week, we examined the last major user interface issue for this application, adding accessibility features so that someone using a keyboard could access all of the options simply by pressing Tab. I received some good feedback on that post. It’s important to me that applications work as well as possible for everyone. This week’s post will start to examine the underlying application source code—starting with the database used to manage the user time entries. This application will have more database information than either of the two series presented so far (Exploring the GrabAPicture Application and Exploring the TypingBuddy Application). In fact, there are a number of different databases you need to consider before writing even a single line of code. Here are the basics—upcoming posts will examine each database in detail. User Settings: Each user will have individual settings that are stored on the local system. For example, a user can choose to select a default project and a default task, making it easy to log into and out of the system each day. The local user settings also contain a pointer to the network drive used to store the group settings and also to store the user’s time entries. The time entries are actually the most important part of the application because they track the user’s daily activities. Default Projects: This is a list of the default projects that a user can select from. Default Tasks: This is a list of the default tasks that the user can perform on a given project. Individual Time Entries: Every time entry consists of a time, the project selected, and the task performed on that project. Every login and log out sequence comes as a pair of time entries. The first entry logs the user into the project to perform a given task, while the second entry logs the user out of the project. Each user has a single log file based on his or her name. These databases are all implemented using XML files, as with the previous series examples, because none of them require true relational capabilities. The reports gather information from the various time logs to create an overview of how the individual or the organization as a whole is using the computer. As part of figuring the databases out, you also need to consider the data storage requirements. Some of the data need not appear on the network drive. In fact, it has to appear on the local drive or the application won’t be able to find the network data location. Other data appears on the network to provide centralized access to it. Here are the storage locations used for the data in this application. C:\Users\<User Name>\AppData\Roaming: Contains the user’s settings and the pointer to the network drive location. \\<Server Name>\<Share Name>\TimeCheck\GroupData: Contains the group settings. Only the administrator can read and write this folder. Regular users can only read this folder. \\<Server Name>\<Share Name>\TimeCheck\<Year>\LogFiles: Contains the individual log files. Administrators can read and write any file. However, regular users can only read and write a specific log file. I had considered using separate files for each project, but this seems unnecessarily cumbersome. Obviously, you may prefer a different log file and folder setup than the one used in the example. The example is extensible so you can modify the locations as needed for your organization. The reason for using a year folder is to make it easier to archive a specific year’s entries when they’re no longer needed. Now that you have a better idea of how the databases are arranged, we’ll begin looking at the code used to implement them starting with the next post. I’m going to be out of the office until July 17th, so we’ll talk about the next post in this series on the Friday that follows (July 20th). Until that time, please let me know if you have any questions about the databases or where they’re stored at John@JohnMuellerBooks.com. You can see the next post in this series at Exploring the TimeCheck Application (Part 7). I must have struck a chord with a few people on Monday (see Real World Global Warming). My inbox has received more than a few notes about weeds. Apparently, Wisconsin isn’t the only place that has been hit hard with them. I’ve received e-mail from a number of locations in the Midwest and a couple of places in areas like Texas. They do seem to be a problem this year. I think that weeds from prehistoric times have taken a sudden urge to sprout. As I mentioned in my post, we’ve taken a new approach to weeding this year. The weeds are so bad that we’re weeding and immediately mulching. Otherwise, within a couple days time, it seems as if the weeds are coming right back. So far, the mulching technique seems to be working. The areas that we’ve managed to eradicate weeds from are staying weed free with the mulch in place. I can only hope the mulch lasts through the summer. I’ve noticed a difference in the weeds this year too. We’re having more problems with quack grass than normal. Quack grass is especially troublesome because normal pulling does little to remove it. In fact, if you use normal pulling techniques (or worse yet, cultivate with a rototiller), you only help spread the quack grass. The major problem with quack grass is that it can grow through anything. We actually had it grow right through our potatoes and you’ll often see the stuff growing up through even tiny cracks in concrete and asphalt. I’ve seen any number of sites recommend using roundup on quack grass. Don’t do it! You’ll only succeed in damaging your soil and other plants. In order to get rid of this pest without damaging other plants in the garden, you must loosen the soil completely and remove the long runner rhizomes. The grass invades from the grassy areas surrounding the garden, so you should work from the inner part of your garden, outward. I’ve removed rhizomes four and five feet (yes, that’s feet) in length. When done carefully, you can remove enough of the quack grass to keep it controlled. I have never managed to eradicate quack grass from our garden, but I do control it well enough that it’s not much of a problem after the initial weeding. Even one rhizome nodule left in place is enough for the plant to start all over again. I use a combination cultivator/mattock to remove our quack grass, especially considering the hard baked clay soil this year. This isn’t a genteel weeding device. Use the cultivator part to carefully break up the soil by going straight down on the edge of the quack grass that points away from the edge of the garden. Raise the tool up slowly and carefully. You’ll normally find the quack grass rhizomes on top of the cultivator tines. Keep working to remove as much of the rhizome as possible in one piece to ensure you get it all. Use the mattock end as needed to break up the soil or to sever the rhizomes when you get to the edge of the grass. Is quack grass bad? Not really! It’s a good plant for controlling erosion. You can’t ask for a better grass to hold a hillside in place. It’s also the best grass I’ve found for the areas where we run our chicken tractors. The chickens can’t seem to kill the stuff off. They will kill absolutely everything else off at some point, but the quack grass keeps coming back. The quack grass also provides good nutrition for our chickens and rabbits. So, it’s not a bad plant—it’s just not wanted in the garden. We’ve also been seeing more pigweed and lambsquarters this year. Both are easily pulled, however, even in the dried out soil we’re currently dealing with. I wasn’t surprised to learn that both of these plants have different names in other areas of the world, so I provided links to them. Finally, our dandelions are growing profusely everywhere. All of these plants are theoretically edible (especially the dandelions) if you can find a clean source of them. I’m contemplating making the dandelions pay the ultimate price for invading our garden—consumption in a salad. The leaves also taste quite nice boiled with a bit of lemon and olive oil. However, for now, we’re just weeding furiously to get the garden in shape and aren’t taking a lot of time to separate the plants. The chickens and rabbits, however, are in seventh heaven. What sorts of weeds are you having to control this year? Do you think we’ll eventually get some rain? Let me know at John@JohnMuellerBooks.com. I encounter a lot of unreadable code because I work through a lot of code I download from the Internet for learning purposes and rework code from failed projects. So, it was with great interest that I opened The Art of Readable Code by Dustin Boswell and Trevor Foucher. After reading this relatively short book, I’m convinced it should be picked up as a college text. If developers would follow even half the advice in the book, many of the truly weird errors in code today would simply disappear because developers wouldn’t end up overwriting the good parts of other developer’s code due to a lack of understanding it. The authors rely heavily on humor to make good points about writing code that is easy to read by others. The cartoons are engaging and fun. I wouldn’t necessarily call them funny—some of the jokes are tongue-in-cheek and others are a bit dry, but they’re all in good taste and make important points. As for the good points in the book, I don’t think I’ve ever seen anyone suggest that a developer actually turn to a thesaurus to find a better name for a variable, but the authors make this point on page 9. The point is made in a humorous way—not as a command as I’ve seen some authors do. I did laugh relatively often. For example, “The Ultra Hard Metal Nail Smashing Rod” reference on page 13 gave me quite a laugh. You’ll need to see the reference for yourself to understand it. You’ll want to pay attention to the frequent Advice blocks in this book. In fact, if you’re short on time, skim the book looking for these blocks (and the Key Idea blocks I describe in the next paragraph) and you’ll improve your coding technique significantly. Some of the advice is obvious to a veteran programmer. For example, on page 25 the authors advise putting max_ or min_ in front of programming elements that describe some sort of limit. (If only novice programmers would follow that simple advice.) I only wish that the Advice blocks appeared with greater regularity later in the book. I would have welcomed advice from the authors on some of the more complex topics. The Key Idea block is another useful addition in the book. For example, on page 122 you find the authors advocating that you create code that only performs one task at a time. Even though this idea seems quite obvious, you’ve probably seen code that is trying to do too much and ends up not doing anything well. The authors back up their Key Ideas with good coding examples (some relatively complex). Unlike the Advice block, the Key Idea block does appear with good consistency throughout the book and the authors have used it quite well. The section on Eliminating Variables that starts on page 94 was especially useful for me. I often create intermediate variables while writing an application to aid in debugging it. The authors provide techniques that greatly simplify code without making it much more difficult to debug later. Even so, sometimes you really do need that intermediate variable for a while. The point is that you should simplify your code as it nears production to reduce complexity, provide fewer failure points, and improve performance. As with any book you buy, this one does forward the author’s agenda. If you follow all of the advice in the book, your programming style will closely reflect the style that the authors use. Anyone who has written a lot of code knows that there are many perfectly acceptable styles of coding. The point is to make your code readable so that someone coming behind you can pick up on your style and quickly discover how your code works. For example, I still prefer to use a form of Hungarian Notation for my applications. Because I apply the notation consistently, my code is readable, but many developers feel that the notation is outmoded. Whether you use Hungarian Notation or not is not the point, the readability of your code is. The authors express their view of Hungarian Notation on page 17—as with many other parts of this book, they take a firm middle ground approach that should serve the reader well. There is a lot to like about this book. As I said at the beginning of the review, colleges would do well to incorporate it into their curriculum. The authors do press their style of coding strongly at times, but I imagine that if I were writing this book I would do the same things, so I can hardly fault them on this point. The content is a bit simplistic for the veteran programmer at the beginning, so you might want to start around Chapter 7. Overall, I think this is a good and much needed book.